Each renewable energy system is unique, and the requirements vary due to the homeowner’s energy usage. Although a system may be adequately designed and sized for one home, it may not be suitable for another home of a similar size. Many home owners and inexperienced installers will improperly size systems, often selecting components in the wrong order, and overlooking several key considerations and requirements which determine efficiency and overall success. (Figure 1) In these circumstances, the battery bank is generally the first to show issues or signs of failure. Don’t make the mistake of purchasing PV panels and an inverter/charger before first completing an energy audit to calculate the estimated storage capacity requirement. This will determine how much power must be generated to adequately recharge the batteries, and ultimately the required PV array, equipment and configuration needed to do so. Undersized charge sources will deficit cycle the battery bank. An undersized battery bank will be heavily discharged. Both scenarios will reduce battery capacity and shorten cycle life. When properly sized, the battery bank will store adequate power to run the system between charge cycles at a desired depth of discharge based on pre-determined load calculations. 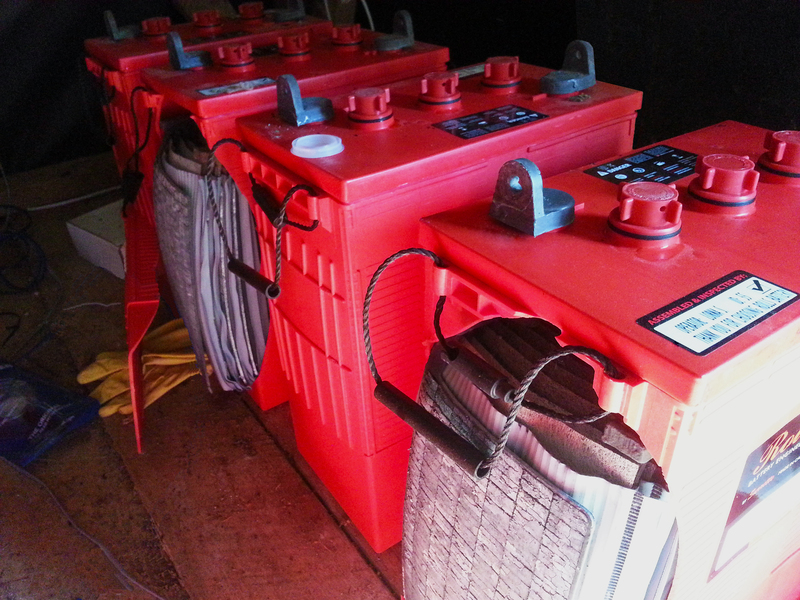 Deep cycle batteries should not be sized to discharge more than 50%, as this will significantly impact cycle life. Most systems are sized to discharge to 60-75% state of charge, providing a balance of cycle life, capacity and cost. The charge source should be sized and selected to produce the adequate voltage and charge output (Amps) to fully recharge the battery bank effectively during a limited timeframe (peak daylight hours). Caution: It is important to follow the proper charge voltage settings outlined by the battery manufacturer; these are specific to the build of the product and are generally a condition of the manufacturer warranty. Do not use the default Bulk, Absorption, and Float voltage settings programmed in the charging equipment unless specified by the battery manufacturer, as these are often lower than recommended. Many inverters/chargers are designed to operate with a temperature sensor mounted to one of the cells, which is used to adjust the charge voltage accordingly. At higher cell temperatures, the charge voltage is lowered from the programmed voltage. At cooler temperatures, the charge voltage is increased slightly (adjustments: 5mv/°C/cell). Systems are commonly set up at default using an inadequate charge voltage of 2.4 VPC, based on ambient temperature at the time of install. This often causes the system to adjust the charge voltage lower than recommended by the battery manufacturer. The result is accelerated sulfation and capacity loss, which may not be immediately identified. To prevent sulfation build-up and prolong the life of the battery bank, systems using temperature compensation should be initial programmed to charge at 2.45 VPC. Temperature sensor readings are only accurate and reliable when sensors are properly installed. Sensors should always be mounted directly to the side of a battery cell, below the liquid level, to ensure an accurate reading. Do not mount a sensor to the top of the battery case, to a terminal, or to the outer case in dual-container models, as this will not provide a reliable measure of cell temperature. Specific gravity readings should be taken with a measured hydrometer or refractometer at the end of the charge cycle when the battery bank is resting in Float charge. Note that increased cell temperatures will raise specific gravity readings. These will lower when the batteries cool following heavy charging. It is important to understand using charging equipment with temperature compensation does not make the system fully self-sufficient. Adjustments to charging parameters may still be necessary based on a variety of factors including varying ambient and operating temperatures, cycling frequency, depth of discharge, and the accumulation of sulfation. Voltage and specific gravity readings should be taken on a regular basis to identify when adjustments to these parameters may be necessary, as well as any spotting issues early on (such as charge imbalance) to prevent cell damage or failure. Performing routine maintenance such as testing, watering, cleaning, and corrective equalizations when needed, is key to protecting an investment in battery-based storage. In addition to primary off-grid homes, these systems have grown in popularity for use in seasonal properties like summer cottages and remote cabins. Whether visits are infrequent, limited to weekends, or simply in locations with limited accessibility throughout the year, these off-grid systems will require ongoing maintenance. 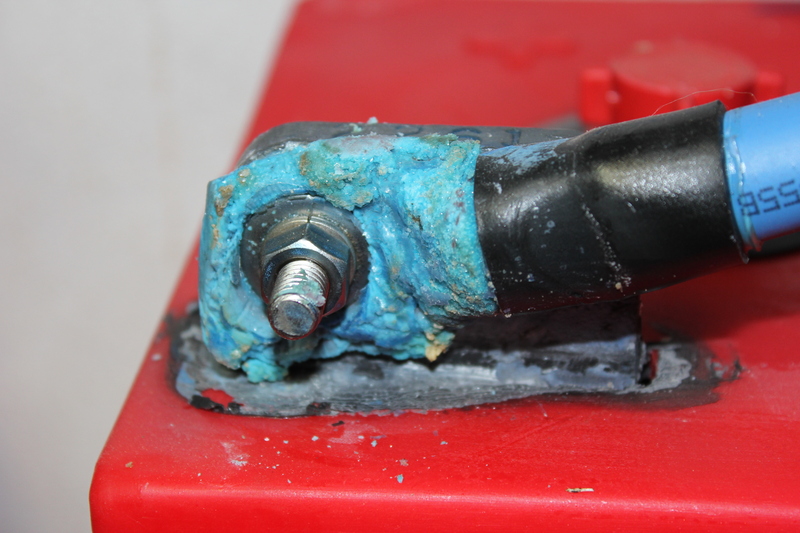 At the beginning and end of the usage season, it is recommended owners perform a corrective equalization on the battery bank to balance the state of charge and clean any build-up of sulfation. Refer to the battery manufacturer for step-by-step instructions and additional considerations. Taking the time to perform these steps will prolong the life of a battery bank considerably. Prior to winter storage, cells should be topped up with distilled water to prevent plate exposure. If the system will be left on, holding the battery bank at Float charge, be aware that PV panels covered in ice or snow will not generate power. System components will still draw power from the battery bank, which can result in heavy discharge if left unattended for extended periods of time. 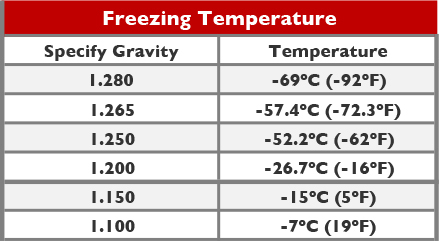 Lowered specific gravity in cold temperatures increases the likelihood of permanent damage due to frozen cells. As the electrolyte drops in specific gravity, the water begins to freeze and expand, causing case bulging or cracking. (Figure 2) Lead is soluble in water, which degrades plate construction and lead oxide paste, reducing capacity and/or shorts the battery. When disconnecting a battery bank for extended periods of time, it is important to fully charge the bank to avoid excessive self-discharge in storage. Jeff Myles is the marketing manager at Rolls Battery Engineering.